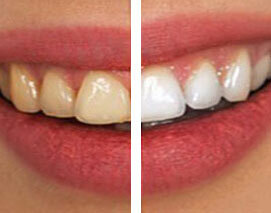 It is not uncommon to have yellowed or stained teeth, but it is not aesthetically pleasing. In fact, most adults have some type of staining or yellowing on their teeth and this is caused from many years of lifestyle choices. Unfortunately, once your teeth are stained, it can be difficult to restore that beautiful white glow that you used to love, but with the help of Dr. Wu and the team at Wu Dental, you can smile with confidence once again. At Wu Dental, we offer teeth whitening services that will help you feel comfortable behind your smile and provide you with beautiful white teeth that you are not afraid to show off. We want to help you brighten up your smile today! Call us at (650) 571-6666 for our San Mateo office or at (650) 718-5086 for our Mountain View office. Professional teeth whitening solutions are almost guaranteed to work and provide you with the whiter smile that you want. Our process of whitening works to lift stains and yellowing, even if it has been there for many years. Our special formula will not cause a breakdown of your enamel, but in fact, strengthen it while working to whiten your teeth. Patients who want to erase years of wear on their teeth can do so in just one hour or two when you visit Wu Dental. Our process is quick, simple, easy, and you will be left with teeth that not only look great but have minimal sensitivity. If you would like to whiten your teeth, do not wait another day and call Wu Dental now. Dr. John Wu and his team will sit down with you and discuss the process while also creating custom fitted trays to ensure that you can continue whitening treatments at home for the best smile possible. Call today to schedule your teeth whitening consultation.